St Malo is France's largest marina, and is only one hour's drive from the beautiful Mont St Michel. Built on a granite island on the Emerald Coast of Brittany, the beautiful city of St Malo rises up from the rock and curves around a natural harbour. Its ancient citadel, the Cathédrale St Vincent, dominates the skyline, and sailing into the port best captures the romance of the town. Walled and built with the same grey granite stone as Mont St-Michel, St Malo was originally in the middle Ages a fortified island at the mouth of river Rance, controlling not only the estuary but the open sea beyond. Now inseparably attached to the mainland, St-Malo is the most visited place in Brittany - thanks more to its superb old Citadelle. From outside the walls, the dignified ensemble of the old city might seem stern and forbidding, but passing through into the streets within the walls brings you into a busy, lively and very characterful town, packed with hotels, restaurants, bars and shops. Though the summer crowds can be oppressive, a stroll atop the ramparts should restore your equilibrium, and the presence of vast, clean beaches right on the city's doorstep is a big bonus if you're travelling with kids. Having to spend a night here before or after a ferry crossing is a positive pleasure - so long as you take the trouble to reserve accommodation in advance. Some of the sites of interest in St. Malo are the Château of Saint-Malo, ramparts, Cathedral of St. Vincent, Grand Aquarium and the tomb of the writer Chateaubriand on the Ile de Grand Bé. In this fortress city of many legends, each street and each stone is a testament to its glorious past. Take a walk down the cobbled streets stopping by the crêperie to enjoy a delicious crepe with a cup of local apple cider or simply relax by the beaches and explore the natural scenery in and around St. Malo. 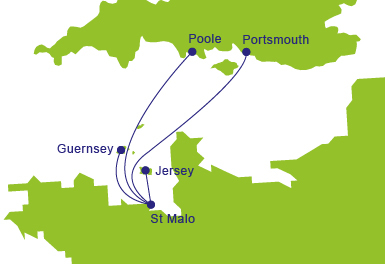 St. Malo Ferry port is easily accessible and offers connections to Poole and Weymouth in England and to Jersey and Guernsey in the Channel Islands. St. Malo ferry port offers facilities such as a cafeteria open for all departures, a shop selling snacks and souvenirs, pay phones, baby changing facilities and disabled assistance. A pay and display car park with a maximum stay of 24 hrs is available near the terminal. By Car, a toll free dual carriageway links St. Malo to N137 and the rest of the French road network. Follow signs at each exit on N137 for St. Malo's Gare Maritime du Naye ferry terminal. By Train, nearest train station is about 2 Km from St. Malo ferry terminal. By Coach, nearest coach terminal is about 10 minutes' walk away from the ferry terminal located opposite the tourist information centre.